Around this time last year I fitted a kitchen maid airier to the space above our stairs and I thought I'd do a "year on" post on how useful we think it is. With two children under the age of two and more than our fair share of sick, wee and the brown stuff, we get through a lot of washing in our house and I think I can safely say that without this we'd be lost! It's been brilliant, it holds a full load of adult washing (baby washing needs miles of drying space as it's all so small). The heat from the fire goes straight up there from the living room and when it's going, it dries within a day. 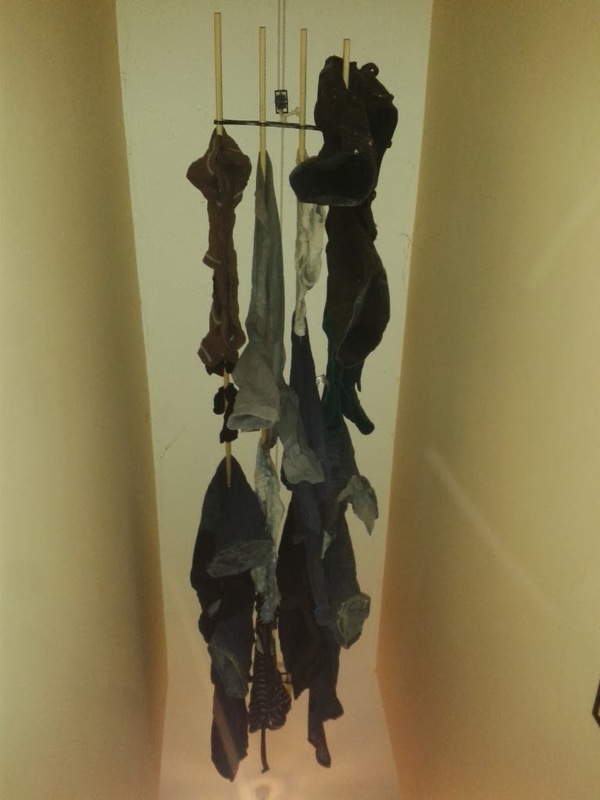 It was also really useful in the summer, if the weather was a bit touch and go you could remove the risk and hang it up in the house to dry. The only downside is my wife is a little clumsy so I won't let her ﻿load it (for fear of her breaking her neck down the stairs). Well last night I got talked into putting the central heating on for the first time this season. More to see if the boiler still works after having the last six months or so off (I think it might be older than me) and also to heat the parts of the house that the wood burning stove can't reach - The bathroom is not a room you want to hang about in after your shower at the moment! The wood burning stove has been great so far this season and saved us loads in heating as it really takes the chill off the house, some days my wife has had it running all day and you can really tell the difference. It has been mild this autumn so that's helped with heating costs and we all wrap up warm before going for the heating - well I write this in a T shirt but apparently I'm not normal! Everyone else fired up their central heating? Sometimes you walk past something a hundred times before you notice it. Like this little game trail. It's from mice/rats and it leads to where one batch of chickens feed and then back under a shed. I thought I'd been good and kept all my poison bate stations topped up. After talking to my dad, he says that they won't eat it if it's gone stale. So on Sunday I cleaned them all out and rebated them with fresh poison. I'm in two minds about this type of pest control. I don't like to poison anything, I worry about how it affects the food chain (many years ago we almost lost a dog who had eaten too many mice that had been poisoned). The only other option I can think of is to get a farm cat, but I love my song birds (although I think the sparrow hawk has had most of those this year) so it's tricky to find a balance. What does everyone else do when it comes to controlling mice and rats (and a quick note to Hippo before his suggestion - I don't think snakes would do very well here as it's too wet! )?